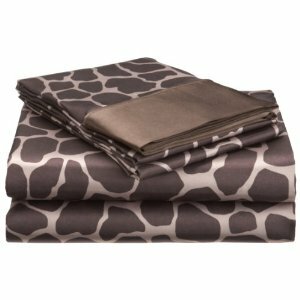 Give in to an enchanted night’s sleep with this luxurious set of satin sheets for queen bed in high-fashion brown/ivory giraffe print. This set includes a flat sheet, fitted sheet, and two standard pillowcases. Smooth and silky with a lustrous sheen, these satin sheets are made of 100 percent woven polyester satin. The fitted sheets feature elastic corners for a secure fit and 14-inch pockets that can fit mattresses up to 17 inches deep. They’re machine washable for easy care.